While Xiaomi has officially confirmed the unveiling date for the Mi Mix 2, nothing else is currently confirmed about the device. Of course, there have been multiple rumors and leaks so far, revealing details like Snapdragon 836 SoC, 6-inch screen, Nougat OS, 3D facial recognition support, and 4,500mAh battery. Now, a new leak has emerged, and from the looks of it, it's aimed at taking the hype surrounding the device to a completely new level. The leak in question says the device will be powered by Snapdragon 836 SoC and run Android 8.0 Oreo out of the box. 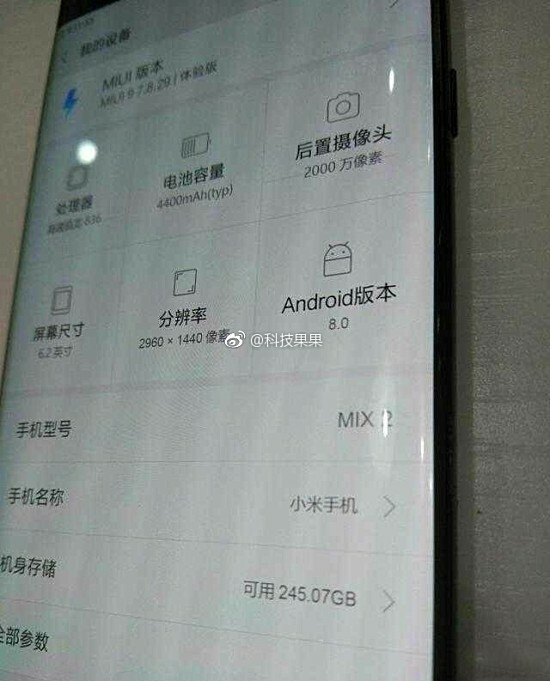 Now, what makes us suspicious about this leak is the fact that Mi Mix 2 unveiling is set for September 11, meaning less than 10 days are left, and Snapdragon 836 SoC is yet to be officially announced by Qualcomm. Aside from this, we also doubt that we'll get to see a new Android 8.0 Oreo-powered phone so soon. 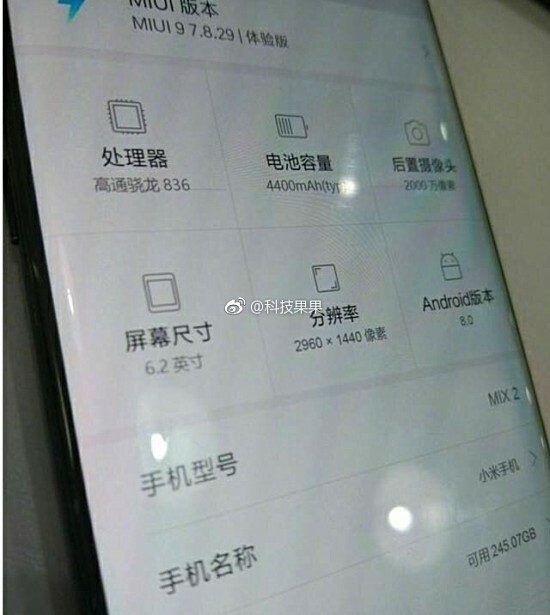 Anyway, the leak also reveals other key specs, including 6.2 inch display with 2960 x 1440 pixel resolution and 4,400mAh memory. The leaked image also shows a 20MP sensor - presumably it's the main unit, which rumors so far suggest would have a dual camera setup. But, that clearly is the settings apps for Miui. How come it does not optimised?